Looking to rent a dumpster in Central Jersey , North or South New Jersey? At Hometown Waste, we offer a variety of products and comprehensive roll-off dumpster rental services in NJ to help make your project or business operation easier and more efficient. We know you’ll encounter a great many options when searching for dumpster rental in Northern New Jersey, but we know you won’t find a service provider that offers the same combination of quality products, affordable prices and exceptional support. At Hometown Waste, we’re proud of our long history serving towns and communities throughout New Jersey, and we do our best to live up to our legacy of outstanding customer service each day. 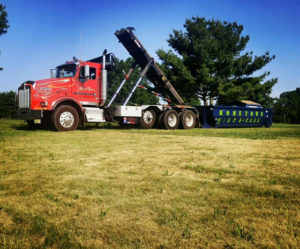 For dumpster rental in Northern NJ, count on the team at Hometown Waste. Don’t see your county listed here? Get in touch with our customer service team to see if we have waste management solutions available for residential, commercial and construction customers in your area. At Hometown Waste, we go above and beyond in delivering the waste management solutions you want and need. That means offering clean dumpster rentals in Central and Northern New Jersey without the hidden costs and fees you may find with a third-party rental service. We also offer wood planks (by request only) you can set your dumpster rental on to protect your driveway or other surfaces. You’ll find a range of dumpster sizes in our inventory, too, including 10-, 20-, 30- and 40-yard dumpster rentals, and you’ll enjoy same-day and Saturday delivery when you rent a dumpster from us. Our focus is on doing whatever we can to meet the unique waste management needs of your home or business.